Welcome to Bingo Websites UK – a site set up by players to help guide you through the (sometimes confusing) world of online bingo. There are literally hundreds of sites out there were you can play bingo online for real money, but some are most definitely better than others. In our reviews and guides we’ll steer you in the right direction to help you find the best bingo site for you, with great offers, positive player feedback and a reputable operator. To kick things off, we’ve included a table of our top ten favourite sites below, all of which come highly recommended by our team of bingo experts. Coral Bingo launched in 2012, and belongs to the infamous Coral betting brand. The site runs on the Virtue Fusion software, and is licensed and regulated by the Gibraltar Gambling Commissioner and the UK Gambling Commission. You will find all bingo imaginable here at Coral Bingo including 40, 49, 50, 75, 80 and 90-ball games, plus a huge a variety of slots, side games and casino too. You can also access other Coral betting platforms easily, should you wish you explore their sports or dedicated casino sites. You will find branded rooms such Rainbow Riches, and Deal or No Deal, as well as fun rooms based on popular TV favourites such as Coronation Street and Emmerdale Farm. There is also lots of free bingo on offer too, plus a room where all games cost as little as 1p. Promotions are aplenty and ever changing and as the site is part of such a huge brand, the jackpots can be extremely exciting. There's £5,000 a day to be won on penny bingo and also a million pound giveaway on certain monthely slots. Place your bets on special X factor and Strictly Come Dancing games too for the chance to win an abundance of prizes. 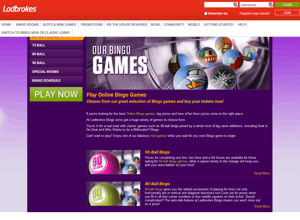 Ladbrokes Bingo opened its online bingo doors way back in 2004, and has been consistently successful ever since. 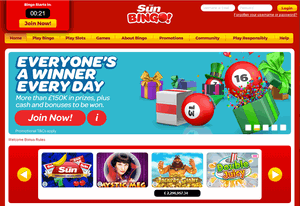 In November 2014 the company gave the bingo site a fantastic new makeover making it modern and sleek, and the gaming options and promotions became even more appealing. The main software used is by Playtech, so you won’t have to download anything in order to play here. Players can enjoy daily specials, big monthly prizes, BOGOF tickets and free bingo games. There’s a huge variety of bingo formats including 75, 80 and 90-ball bingo across several exclusive rooms and also branded rooms such as Lucky Numbers and Who Wants To Be A Millionaire. 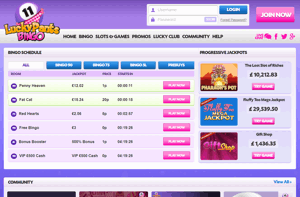 The site allows players to chat, play bingo and also play additional side and table games too. You will automatically gain access to all Ladbrokes platforms upon registration, so you will be able to hop on over to their sports, casino and lotto sites too. But the bingo site does host a small collection of slots, scratch cards and casino games as part of Ladbrokes Bingo, so there are plenty of options for all levels of gamers! One of the more popular promotions is the Bonus Back bingo games. 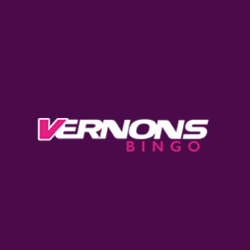 Every Friday night between 9pm and 11pm GMT, if you don’t win on any of the lines then you will have your losing tickets refunded and be credited with a Bingo bonus. 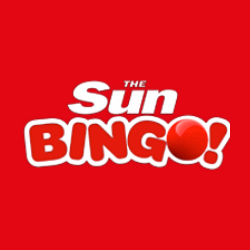 Sun Bingo started in 2006, and came about due to the popular demand in the infamous paper bingo cards which came every week with The Sun Newspaper. 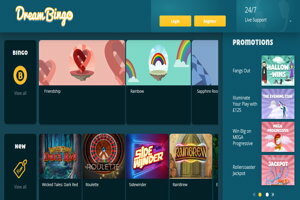 The site migrated to the Playtech bingo software in 2016 which saw a much a slicker site with more exciting games and jackpots, but still kept the same theming which has been so popular with fans over the years. The brand is registered to News Group Newspapers Ltd, and is licensed and regulated in Alderney and the UK. Running on such great software means you get access to a vast network of games, including Deal or No Deal, Cash Cubes and Bouncy Balls rooms, plus rooms completely exclusive to Sun Bingo players. All games come in either 36, 75, 80 or 90-ball formats, and tickets can cost as little as a penny. You will also find a huge range of slots titles and casino games too, including progressive jackpot slots games with mega prizes. The Sun Newspaper also saw the creation of the beloved Mystic Meg character, and here you will find her special Wheel Of Destiny game. The main advantages of playing with a brand like Sun is that it's great value for money, and customer care and focus is at the forefront of their minds. The resources shine through which often means better value for players over time, and in terms of promotions, few can match the sheer number and value available here. There are also lots of linked deals with the newspaper itself if you read it. 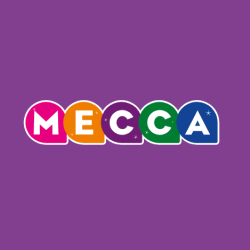 Mecca Bingo is one of the biggest names in bingo and has been a household name now for over 50 years. Chances are you will have seen one of the many of the Billboards and TV advertisements, or even visited one of their infamous bingo halls at some point too. The site runs on the Playtech bingo software and is owned by Rank Leisure Holdings Ltd and licensed in Alderney. 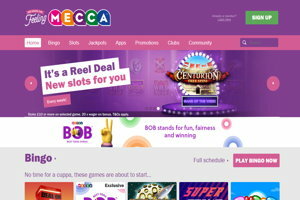 At Mecca Bingo, games, promotions, chat rooms and fun come in absolute abundance, and the site has won many awards over the years bringing players back again and again. With 20 Bingo rooms in total, there is a huge variety of 75, 80 and 90-ball bingo on offer including Britain's Got Talent and Deal or No Deal themes for any popular TV fans out there. There is also large assortment of slots, casino and scratch card games available too making this not only a brilliant bingo site, but a great site all round. The lobby is clear, bright and bursting with colour, and the promotions are fantastic including a great sign up bonus, arguably one of the finest offers around. The team here take huge pride in their customer service and satisfaction, and the Mecca Promise is to always offer complete excellence, safety and loyalty to all its players, all of the time. 32Red Bingo came about in 2003, and is part of the successful online gambling group, 32Red PLC. The company have been around for numerous years now, and are a well known brand and trusted choice. The bingo site is powered on the Microgaming software, and the company are licensed and regulated in Gibraltar and the UK. In 2016 the site underwent a snazzy new makeover which resulted in a much more thrilling site. It's themed around all the fun of the funfair, with moving HD rollercoaster graphics, and changing skylines from morning through till night. In terms of bingo, you will only find variants of 75 and 90-ball games, but these are spread across 5 fun rooms which are non branded and exclusive to Microgaming players.You can also play a huge selection of slots, casino and table games across the site too, so there's plenty of choice in additional gaming. Grab big bonuses and take part in many different promotions that are ever changing, and the progressive jackpots on offer reach huge heights. The community hub is constantly buzzing too, with loads of fun chat games and treats to enjoy alongside your bingo. Enjoy reload bonuses, free bingo games, casino bonuses, and a refer a friend scheme too. Bucky Bingo runs on the Virtue Fusion Bingo Software and have over 40 years experience in the UK bingo industry. In 1970 they opened their first land based bingo hall under Buckingham Bingo, and then in 2007 the first online bingo site was launched. In 2011, Buckingham Bingo became Bucky Bingo, and this saw the birth of a fresh new site with a fun mascot, Bucky the Horse himself. The bingo on offer here is simple and classic, and all games come in either 75 or 90-ball formats. 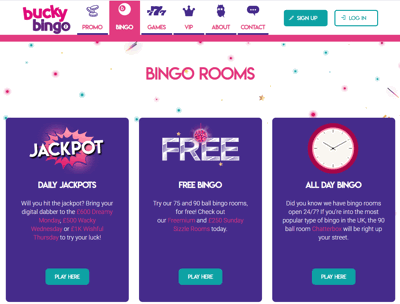 There are exclusive Bucky Bingo rooms, as well as bigger branded rooms such as Rainbow Riches and Deal or No Deal. There aren't a huge selection of side games available, however you will find a small variety of slots and progressive slots titles. 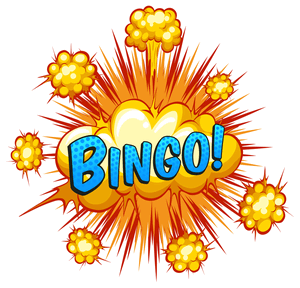 You can also play free bingo here every day of the week, allowing you to win at completely zero cost. This free bingo room is open between 10am and 11am plus 10pm and 11pm every day. Promotions include a great bingo VIP scheme, plus the Super Sunday £5 bonus and the exclusive Bucky Cashback giveaway. 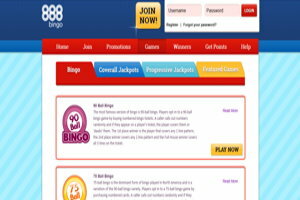 888 Bingo launched in 2009, and is part of the 888 PLC Group and Cassava Enterprises. This online bingo site is one of the best known sites in the business, and is part of the popular Dragonfish Network. It is the sister site of the well known and well established 888 Ladies Bingo, and the 888 brand is a hugely trusted name in the online bingo community. Being powered on such popular software means that the vast majority of the bingo rooms, jackpots and prizes are shared amongst the other 100+ bingo sites on this network. That’s not necessarily a bad thing however, because it means far more choice, bigger prizes and even bigger jackpots. The bingo schedule shows you which games are available, and these come primarily in eiter 75 or 90-ball formats. There is also a special High 5 bingo variant which allows players the chance to win 5 times. There aren't a huge selection of side games available, but you will find a decent selection of popular slots like X Factor and Deal or No Deal. Betfair Bingo belongs to the highly renowned Betfair brand. As a leading competitor in online poker, sports, and casino offerings, Betfair added bingo to the list in early 2000. The site runs on the popular Virtue Fusion Software, which is licensed and regulated by The Alderney Gambling Control Commission. For UK customers, Bingo is offered by PPB Entertainment LTD, and is licensed and regulated by the UK Gambling Commission. There is a huge range of bingo on offer at Betfair. All games come in either 75 or 90-ball formats, and take place across exclusive Betfair rooms and also bigger branded rooms such as Rainbow Riches, and Deal or No Deal. You will also find over 80 great slots titles including popular favourites such as Leprechaun's Luck and Fluffy Favourites. 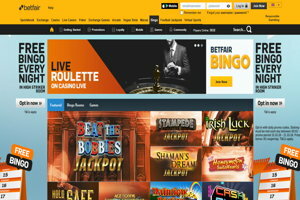 You can access all of the other Betfair platforms via the bingo site too, so its easy to venture into casino or poker for instance. There are always great promotions up for grabs including the £500K weekender and 1000 chances to win £1000, and there is also a great loyalty scheme in place where you can earn points for even more amazing prizes. 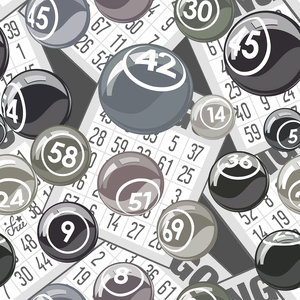 Lucky Pants Bingo launched in March 2013, and is one of only three online bingo sites to use a brand new Bingo software run by Daub Gaming. 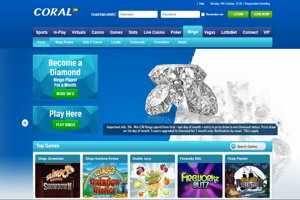 This offers players a more unique Bingo experience, and you will find games and offers totally exclusive to this site. The Lucky Pants mascots Betty Balls and Luke Pants were introduced in 2014, and if you manage to spot these crazy characters throughout your play, you may be rewarded with a special Lucky Pants bingo bonuses. These can range from free spins through to special physical prizes, and it just adds a nice unique feature to the site. If you love a bit of humour with your gaming, then Lucky Pants Bingo is certainly the site for you. There are friendly chat hosts available throughout all the games, and the site has a real warm and friendly feel. The bingo on offer is fairly classic and mainly comes in either 75 or 90-ball formats. You can also find lots of speed bingo too, and there is a room exclusively dedicated to free bingo every day. Lucky Pants Bingo offer a small but decent selection of slots, scratch cards and casino games aswell, and you'll also find plenty of promotions and a loyalty club available too. Grab free spins, reload bonuses, cashback bonuses, vouchers and more whilst gaming away on this cheeky and social site. 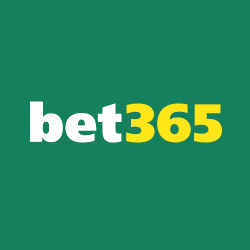 Dream Bingo launched in the summer of 2007 and belongs to the ever popular Betway betting brand. It has become extremely popular in this short space of time and runs on the popular Microgaming Bingo Software. Betway Ltd is registered in Malta, and the site is licensed and regulated by the Malta Gaming Authority and the UK Gambling Commission. The bingo on offer is fairly classic in style, and primarily comes in either a 75 or 90-ball format. You will also find access to the popular Immortal Romance bingo room too, plus hours of free bingo and fun bingo chat games. There is a vast variety of top class slots and casino on offer too, including classic table games and huge progressive jackpot slots. You can also access all of the other Dream platforms via the bingo site, so its easy to check out all that Dream has to offer. There's plenty of cash to be won and lots of promotions that are updated quite regularly. You'll find the fantastic £600 Friday Fietsa and lots of free and Buy One Get One Free bingo too, plus a fabulous loyalty scheme for even more bonuses and giveaways. Did you know? Online bingo is 100% legal in the UK provided that the player is of age (18+) and the bingo site is licensed in the United Kingdom. For that reason all of the bingo rooms you see listed on this website are regulated by the UK gambling commission. Looking For More Bingo Sites? The ten sites listed above represent a small selection our favourites from across the various bingo neworks. If you want to see a larger list of bingo sites, or want to know what promotions are on offer at each site, then head to our bonuses page below. Most bingo sites operate on a network – this is to ensure their players have access to round the clock games filled with plenty of players. There are a number of big name networks, including Virtue Fusion, Microgaming and Dragonfish as well as smaller more niche networks such as B-Livegaming. Below you’ll find links to our guides to these networks, as well as lists of bingo rooms that operate on them. To see a list of sites on a particular network, or read more about them – including the features they offer – click the relevant guide above. 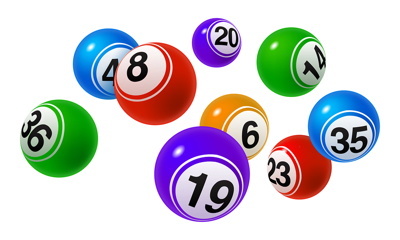 Alternatively head over to our bingo software & networks section. Playing bingo for real money on the web requires some way of getting your money into the site to buy tickets, and your winnings out (to spend on holidays!). There are a number of ways of doing this, the most obvious being what you have in your wallet or purse – credit and debit cards. But there are a number of other ways of doing it too including everyone’s favourite online shopping tool – PayPal. Other popular eWallet solutions include Neteller and Skrill. If you want to keep your bank and cards out of it completely, there are cash vouchers systems such as Paysafecard – here you purchase vouchers to use online at local shops, including most supermarkets and anywhere that displays the yellow paypoint logo. Finally, there’s a true cash banking system where you can literally put cash into and get cash out of your bingo site, without the need for an intermediate voucher. Relatively few sites offer this and it’s primarily bingo rooms who are owned by an online bookmaker such as Coral or Ladbrokes. By registering for their cash banking service you can use the teller at the betting shop to move your money instantly into or out of your bingo account. For more details about any of the payment methods listed above, visit the relevant site. Or head over to our banking section. Play Bingo With Webcams – That’s right, you can literally play bingo with webcams. Except instead of watching a live stream of someone picking out bingo balls, the star of the show is you! Whilst completely optional, those who have their webcams turned on get 15 seconds of fame whenever they win a prize. We’ve even seen a proposal on the site! And to encourage players to get involved you even get extra bonus winnings on top of the regular prize when you do. For more details, see the bingocams website. Multi Room Bingo – Not satisfied with just one game at a time? No problem – at Virtue Fusion powered rooms you can play multiple games at the same time and on the same screen. This is available at all bingo rooms on the network, so head over to our VF bingo page and take your pick. Deposit In Cash – We mentioned this in the payment section, but for those of you who are skimming the site we wanted to bring it up again, because it’s so awesome. With Coral (and a number of other big UK high street names) you can deposit and withdraw in cash through any one of their 1,800+ betting shops. Meaning no waiting for funds to clear! You can find out more details on the Coral website. As well as reviews, lists and bonuses we’ve also written a number of articles and guides to on bingo topics. Including progressive jackpots, bingo history, legalities and many more… We’ve even got a handy guide to chat room lingo, for those newbies amongst you who are wondering what everyone’s going on about in the chat box! Top 10 Bingo Sites – Our top 10 favourite bingo sites, including a quick summary of what we love about them. Bingo Games – There’s actually a choice of games for you to play. This article will have you knowing your 90 ball from your 80 ball in no time. Is Online Bingo Legal in the UK – The short answer is yes it is! For the longer more complex answer, see our guide. Progressive Jackpots – Want to win hundreds of thousands, or even millions of pounds? Then you’l need to be playing a game with a progressive jackpot. These are just the highlights – we have many more. For the full list, see our articles page. Finally, we thought we should tell you a little more about our site. BingoWebsites.org.uk is run by two bingo entheusiasts, and has been created as a web guide to bingo, covering everything you’ll need to know when playing online – from reviews of top bingo sites and huge lists of bonuses, through to information on how bingo networks physically operate. We’re always looking for new bingo sites, writing reviews and coming up with ideas for more guides – so don’t be a stranger, and make sure you stop by between games!